For the idea of a planet orbiting the sun directly opposite Earth, see Counter-Earth. 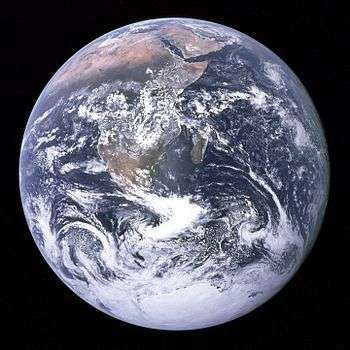 An Earth analog (also referred to as a Twin Earth, Earth Twin, or Earth-like planet, though this latter term may refer to any terrestrial planet) is a planet or moon with environmental conditions similar to those found on the planet Earth. The possibility is of particular interest to humans under reasoning that the more similar a planet is to Earth, the more likely it is of sustaining complex extraterrestrial life. As such, it has long been speculated and the subject expressed in science, philosophy, science fiction and popular culture. Advocates of space colonization have long sought an Earth analog as a "second home", while advocates for space and survival would regard such a planet as a potential "new home" for mankind. Before the scientific search for and study of extrasolar planets, the possibility was argued through philosophy and science fiction. The mediocrity principle suggests that planets like Earth should be common in the universe, while the Rare Earth hypothesis suggests that they are extremely rare. Philosophers have pointed out that the size of the universe is such that a near-identical planet must exist somewhere. In the future, technology may be used by humans to artificially produce an Earth analog by terraforming. The multiverse theory suggests that an Earth analog could exist in another universe or even be another version of the Earth itself in a parallel universe. On November 4, 2013, astronomers reported, based on Kepler space mission data, that there could be as many as 40 billion Earth-sized planets orbiting in the habitable zones of Sun-like stars and red dwarf stars within the Milky Way galaxy. 11 billion of these estimated planets may be orbiting Sun-like stars. The nearest such planet may be 12 light-years away. Scientific findings since the 1990s have greatly influenced the scope of the fields of astrobiology, models of planetary habitability and the search for extraterrestrial intelligence (SETI). NASA and the SETI Institute have proposed categorising the increasing number of planets found using a measure called the Earth Similarity Index (ESI) based on mass, radius and temperature. According to this measure, as of 23 July 2015, the confirmed planet currently thought to be most similar to Earth on mass, radius and temperature is Kepler-438b. Scientists estimate that there may be billions of Earth-size planets within the Milky Way galaxy alone. Around 400 BC, Philolaus proposed that there existed a Counter-Earth, a counterbalance of the same mass to prevent the universe from being flung apart. Between 1858 and 1920, Mars was thought by many, including some scientists, to be very similar to Earth, only drier with a thick atmosphere, similar axial tilt, orbit and seasons as well as a Martian civilization that had built great Martian canals. These theories were advanced by Giovanni Schiaparelli, Percival Lowell and others. As such Mars in fiction portrayed the red planet as similar to Earth but with a desert like landscape. Images and data from the Mariner (1965) and Viking space probes (1975–1980), however, revealed the planet as a barren cratered world. However, with continuing discoveries, other Earth comparisons remained. For example, the Mars Ocean Hypothesis had its origins in the Viking missions and was popularised during the 1980s. With the possibility of past water, there was the possibility that life could have begun on Mars and it was once again perceived to be more Earth-like. Likewise, until the 1960s, Venus was believed by many, including some scientists, to be a warmer version of Earth with a thick atmosphere and either hot and dusty or humid with water clouds and oceans. Venus in fiction was often portrayed as having similarities to Earth and many speculated about Venusian civilization. These beliefs were dispelled in the 1960s as the first space probes gathered more accurate scientific data on the planet and found that Venus is a very hot world with the surface temperature around 900 °F (482 °C) under an acidic atmosphere 92 times thicker the Earth's. 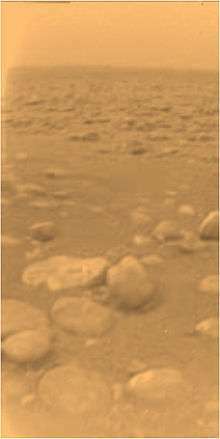 From 2004, Cassini–Huygens began to reveal Saturn's moon Titan to be one of the most Earth-like worlds outside of the habitable zone. Though having a dramatically different chemical makeup, discoveries such as the confirmation of Titanian lakes, rivers and fluvial processes in 2007, advanced comparisons to Earth. Further observations including weather phenomena has aided the understanding of geological processes that may operate on Earth-like planets. The Kepler space telescope began observing the transits of potential terrestrial planets in the habitable zone from 2011, though the technology provided a more effective means for detecting and confirming planets, it was unable to conclude definitively how Earth-like the candidate planets actually are. In 2013, several Kepler candidates less than 1.5 Earth radii were confirmed orbiting in the habitable zone of stars. It was not until 2015, that the first near-Earth sized candidate orbiting a solar candidate, Kepler-452b, was announced. The probability of finding an Earth analog depends mostly on the attributes that are expected to be similar, and these vary greatly. Generally it is considered that it would be a terrestrial planet and there have been several scientific studies aimed at finding such planets. Often implied but not limited to are such criteria as planet size, surface gravity, star size and type (i.e. Solar analog), orbital distance and stability, axial tilt and rotation, similar geography, oceans, air and weather conditions, strong magnetosphere and even the presence of Earth-like complex life. If there is complex life, there could be some forests covering much of the land. If there is intelligent life, some parts of land could be covered in cities. Some factors that are assumed of such a planet may be unlikely due to Earth's own history. For instance the Earth's atmosphere was not always oxygen-rich and this is a biosignature from the emergence of photosynthetic life. The formation, presence, influence on these characteristics of the Moon (such as tidal forces) may also pose a problem in finding an Earth analog. Size Comparisons: Kepler-20e and Kepler-20f with Venus and Earth. Size is often thought to be a significant factor, as planets of Earth's size are thought more likely to be terrestrial in nature and be capable of retaining an Earth-like atmosphere. The list includes planets within the range of 0.8–1.9 Earth masses, below which are generally classed as sub-Earth and above classed as super-Earth. In addition, only planets known to fall within the range of 0.5–2.0 Earth radius (between half and twice the radius of the Earth) are included. In contrast, the Earth Similarity Index uses both mass and radius as criteria. Kepler-69c 0.98 1.7 Originally thought to be in the circumstellar habitable zone (CHZ), now thought to be too hot. Kepler-9d >1.5 1.64 Extremely hot. COROT-7b <9 1.58 Extremely hot. 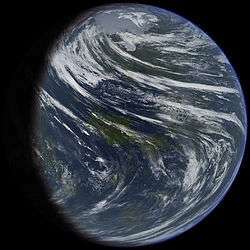 Kepler-20f < 14.3 1.03 Slightly larger and likely more massive, far too hot to be Earth-like. Tau Ceti b 2 Extremely hot. Not known to transit. Alpha Centauri Bb 1.1 Closest known mass to Earth but much hotter. NOTE: May not exist (NYT, June 10, 2013). Kepler-186f 1.1 Orbits in CHZ. Earth 1 1 Orbits in habitable zone. Venus 0.815 0.949 Much hotter. 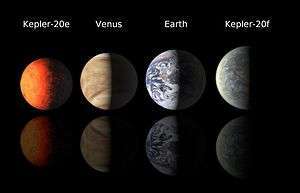 Kepler-20e < 3.08 0.87 Too hot to be Earth-like. Proxima b >1.27 >1.1 Closest exoplanet to Earth. This comparison indicates that size alone is a poor measure, particularly in terms of habitability. Temperature must also be considered as Venus and the planets of Alpha Centauri B (discovered in 2012), Kepler-20 (discovered in 2011), COROT-7 (discovered in 2009) and the three planets of Kepler-42 (all discovered in 2011) are very hot, and Mars, Ganymede and Titan are frigid worlds, resulting also in wide variety of surface and atmospheric conditions. The mass of the Solar System's moons are a tiny fraction of that of Earth whereas the mass of extrasolar planets are very difficult to accurately measure. However discoveries of Earth-sized terrestrial planets are important as they may indicate the probable frequency and distribution of Earth-like planets. Another criterion often cited is that an Earth analog must be terrestrial, that is, it should possess a similar surface geology—a planetary surface composed of similar surface materials. 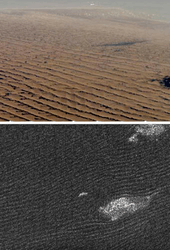 The closest known examples are Mars and Titan and while there are similarities in their types of landforms and surface compositions, there are also significant differences such as the temperature and quantities of ice. Many of Earth's surface materials and landforms are formed as a result of interaction with water (such as clay and sedimentary rocks) or as a byproduct of life (such as limestone or coal), interaction with the atmosphere, volcanically or artificially. A true Earth analog therefore might need to have formed through similar processes, having possessed an atmosphere, volcanic interactions with the surface, past or present liquid water and life forms. There are several factors that can determine planetary temperatures and therefore several measures that can draw comparisons to that of the Earth in planets where atmospheric conditions are unknown. Equilibrium temperature is used for planets without atmospheres. With atmosphere, a greenhouse effect is assumed. Finally, surface temperature is used. Each of these temperatures is affected by climate, which is influenced by the orbit and rotation (or tidal locking) of the planet, each of which introduces further variables. Below is a comparison of the confirmed planets with the closest known temperatures to Earth. Another criteria of an Earth analog is that it should orbit a solar analog, that is, a star much like our Sun, similar photometrically or in terms of spectral type. It follows that the composition of a planet around a solar twin with similar metallicity might have a similar composition to Earth. Also, this would help eliminate stellar extremes and variability that may be applicable to other types of stars. While planets have been discovered orbiting similar stars to the Sun, most are gas giant or super-Earth sized, and many of these planetary systems have shown to be surprisingly different from our own. This measure is not entirely reliable as Mars and Venus also orbit the Sun but have different compositions and properties. Water covers 70% of Earth's surface and is required by all known life. The concept of the habitable zone (or Liquid Water Zone) defining a region where water can exist on the surface, is based on the properties of both the Earth and Sun. Under this model, Earth orbits roughly at the centre of this zone or in the "Goldilocks" position. Earth is the only planet in the universe confirmed to possess large bodies of surface water. Venus is on the hot side of the zone while Mars is on the cold side. Neither are known to have persistent surface water, though evidence exists that Mars did have in its ancient past, and it is speculated that the same was the case for Venus. Thus extrasolar planets (or moons) in the Goldilocks position with substantial atmospheres may possess oceans and water clouds like those on Earth. 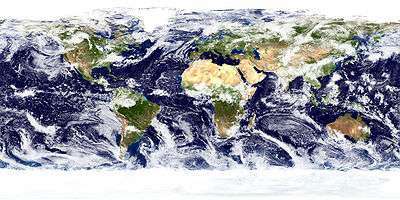 In addition to surface water, a true Earth analog would require a mix of oceans or lakes and areas not covered by water, or land. Some argue that a true Earth analog must not only have a similar position of its planetary system but also orbit a solar analog and have a near circular orbit such that it remains continually habitable like Earth. The Solar System has shown that just being in the habitable zone does not guarantee that a planet is "Earth-like". The mediocrity principle suggests that there is a chance that serendipitous events may have allowed an Earth-like planet to form elsewhere that would allow the emergence of complex, multi-cellular life. In contrast, the Rare Earth hypothesis asserts that if the strictest criteria are applied, such a planet, if it exists, may be so far away that humans may never locate it. Because the Solar System proved to be devoid of an Earth analog, the search has widened to extrasolar planets. Astrobiologists assert that Earth analogs would most likely be found in a stellar habitable zone, in which liquid water could exist, providing the conditions for supporting life. Some astrobiologists, such as Dirk Schulze-Makuch, estimated that a sufficiently massive natural satellite may form a habitable moon similar to Earth. The frequency of Earth-like planets in both the Milky Way and the larger universe is still unknown. It ranges from the extreme Rare Earth hypothesis estimates – one (i. e., Earth) – to innumerable. Several current scientific studies, including the Kepler mission, are aimed at refining estimates using real data from transiting planets. A 2008 study by astronomer Michael Meyer from the University of Arizona of cosmic dust near recently formed Sun-like stars suggests that between 20% and 60% of solar analogs have evidence for the formation of rocky planets, not unlike the processes that led to those of Earth. Meyer's team found discs of cosmic dust around stars and sees this as a byproduct of the formation of rocky planets. In 2009, Alan Boss of the Carnegie Institution of Science speculated that there could be 100 billion terrestrial planets in our Milky Way galaxy alone. 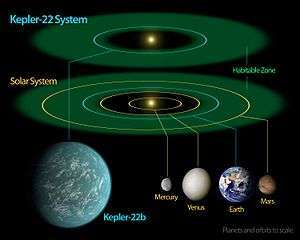 In 2011 NASA's Jet Propulsion Laboratory (JPL) and based on observations from the Kepler Mission is that about 1.4% to 2.7% of all Sun-like stars are expected to have Earth-size planets within the habitable zones of their stars. 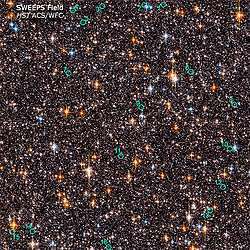 This means there could be two billion of them in the Milky Way galaxy alone, and assuming that all galaxies have a similar number as the Milky Way, in the 50 billion galaxies in the observable universe, there may be as many as a hundred quintillion. 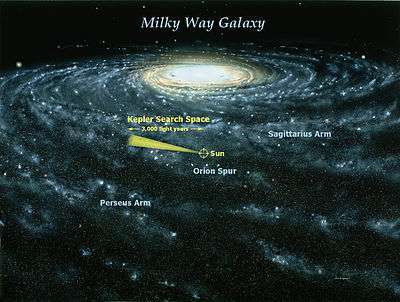 In 2013, a Harvard-Smithsonian Center for Astrophysics using statistical analysis of additional Kepler data suggested that there are at least 17 billion Earth-sized planets in the Milky Way. This, however, says nothing of their position in relation to the habitable zone. Terraforming (literally, "Earth-forming") of a planet, moon, or other body is the hypothetical process of deliberately modifying its atmosphere, temperature, surface topography or ecosystems to be similar to those of Earth to make it habitable to humans. Due to proximity and similarity in size, Mars, and to a lesser extent Venus, have been cited as the most likely candidates for terraforming. 1 2 3 Petigura, Eric A.; Howard, Andrew W.; Marcy, Geoffrey W. (October 31, 2013). "Prevalence of Earth-size planets orbiting Sun-like stars". Proceedings of the National Academy of Sciences of the United States of America. 110 (48): 19273. arXiv:1311.6806 . Bibcode:2013PNAS..11019273P. doi:10.1073/pnas.1319909110. Retrieved November 5, 2013. ↑ Brown, Mark (21 November 2011). "Exoplanet hunters propose system to find life-supporting worlds". Wired Science. Retrieved 2015-09-18. ↑ "HEC: Data of Potentially Habitable Worlds". Planetary Habitability Laboratory. University of Puerto Rico. January 13, 2016. Retrieved 2016-03-13. ↑ O'Gallagher, J.J.; Simpson, J.A. (September 10, 1965). "Search for Trapped Electrons and a Magnetic Moment at Mars by Mariner IV". Science, New Series. 149 (3689): 1233–1239. Bibcode:1965Sci...149.1233O. doi:10.1126/science.149.3689.1233. PMID 17747452. ↑ Smith, Edward J.; Davis Jr., Leverett; Coleman Jr., Paul J.; Jones, Douglas E. (September 10, 1965). "Magnetic Field Measurements Near Mars". Science, New Series. 149 (3689): 1241–1242. Bibcode:1965Sci...149.1241S. doi:10.1126/science.149.3689.1241. PMID 17747454. ↑ Leighton, Robert B.; Murray, Bruce C.; Sharp, Robert P.; Allen, J. Denton; Sloan, Richard K. (August 6, 1965). "Mariner IV Photography of Mars: Initial Results". Science, New Series. 149 (3684): 627–630. Bibcode:1965Sci...149..627L. doi:10.1126/science.149.3684.627. PMID 17747569. ↑ Kliore, Arvydas; Cain, Dan L.; Levy, Gerald S.; Eshleman, Von R.; Fjeldbo, Gunnar; Drake, Frank D. (September 10, 1965). "Occultation Experiment: Results of the First Direct Measurement of Mars's Atmosphere and Ionosphere". Science, New Series. 149 (3689): 1243–1248. Bibcode:1965Sci...149.1243K. doi:10.1126/science.149.3689.1243. PMID 17747455. ↑ Salisbury, Frank B. (April 6, 1962). "Martian Biology". Science, New Series. 136 (3510): 17–26. Bibcode:1962Sci...136...17S. doi:10.1126/science.136.3510.17. PMID 17779780. ↑ Kilston, Steven D.; Drummond, Robert R.; Sagan, Carl (1966). "A Search for Life on Earth at Kilometer Resolution". Icarus. 5 (1–6): 79–98. Bibcode:1966Icar....5...79K. doi:10.1016/0019-1035(66)90010-8. 1 2 Hashimoto, G. L.; Roos-Serote, M.; Sugita, S.; Gilmore, M. S.; Kamp, L. W.; Carlson, R. W.; Baines, K. H. (2008). "Felsic highland crust on Venus suggested by Galileo Near-Infrared Mapping Spectrometer data". Journal of Geophysical Research: Planets. 113: E00B24. Bibcode:2008JGRE..11300B24H. doi:10.1029/2008JE003134. ↑ "Cassini Reveals Titan's Xanadu Region To Be An Earth-Like Land". Science Daily. July 23, 2006. Retrieved 2007-08-27. ↑ "Seeing, touching and smelling the extraordinarily Earth-like world of Titan". ESA News, European Space Agency. January 21, 2005. Retrieved 2005-03-28. ↑ "Cassini-Huygens: News". Saturn.jpl.nasa.gov. Retrieved 2011-08-20. ↑ "NASA – NASA's Kepler Confirms Its First Planet in Habitable Zone of Sun-like Star". NASA Press Release. Retrieved 6 December 2011. ↑ Petigura, E. A.; Howard, A. W.; Marcy, G. W. (2013). "Prevalence of Earth-size planets orbiting Sun-like stars". Proceedings of the National Academy of Sciences. 110 (48): 19273–19278. arXiv:1311.6806 . Bibcode:2013PNAS..11019273P. doi:10.1073/pnas.1319909110. ISSN 0027-8424. ↑ Jenkins, Jon M.; Twicken, Joseph D.; Batalha, Natalie M.; Caldwell, Douglas A.; Cochran, William D.; Endl, Michael; Latham, David W.; Esquerdo, Gilbert A.; Seader, Shawn; Bieryla, Allyson; Petigura, Erik; Ciardi, David R.; Marcy, Geoffrey W.; Isaacson, Howard; Huber, Daniel; Rowe, Jason F.; Torres, Guillermo; Bryson, Stephen T.; Buchhave, Lars; Ramirez, Ivan; Wolfgang, Angie; Li, Jie; Campbell, Jennifer R.; Tenenbaum, Peter; Sanderfer, Dwight; Henze, Christopher E.; Catanzarite, Joseph H.; Gilliland, Ronald L.; Borucki, William J. (23 July 2015). "Discovery and Validation of Kepler-452b: A 1.6 R⨁ Super Earth Exoplanet in the Habitable Zone of a G2 Star". The Astronomical Journal. 150 (2): 56. arXiv:1507.06723 . Bibcode:2015AJ....150...56J. doi:10.1088/0004-6256/150/2/56. ISSN 1538-3881. Retrieved 24 July 2015. ↑ "NASA telescope discovers Earth-like planet in star's 'habitable zone". BNO News. 23 July 2015. Retrieved 23 July 2015. 1 2 3 NASA Staff (20 December 2011). "Kepler: A Search For Habitable Planets – Kepler-20e". NASA. Retrieved 2011-12-23. 1 2 3 NASA Staff (20 December 2011). "Kepler: A Search For Habitable Planets – Kepler-20f". NASA. Retrieved 2011-12-23. ↑ Erkaev, N.V.; Lammer, H.; Elkins-Tanton, L.T. ; Stökl, A.; Odert, P.; Marcq, E.; Dorfi, E.A. ; Kislyakova, K.G. ; Kulikov, Yu.N. ; Leitzinger, M.; Güdel, M. (2014). "Escape of the martian protoatmosphere and initial water inventory". Planetary and Space Science. 98: 106–119. arXiv:1308.0190 . Bibcode:2014P&SS...98..106E. doi:10.1016/j.pss.2013.09.008. ISSN 0032-0633. PMC 4375622 . PMID 25843981. ↑ Torres, Guillermo; Fressin, François (2011). "Modeling Kepler transit light curves as false positives: Rejection of blend scenarios for Kepler-9, and validation of Kepler-9d, a super-Earth-size planet in a multiple system" (PDF). Astrophysical Journal. 727 (24): 24. arXiv:1008.4393 . Bibcode:2011ApJ...727...24T. doi:10.1088/0004-637X/727/1/24. Retrieved 20 March 2011. ↑ "Earth-like planet discovered next to our Solar System". The Daily Telegraph. London. 17 October 2012. ↑ Overbye, Dennis (10 June 2013). "Hold Off on the Alpha Centauri Trip". New York Times. Retrieved June 11, 2013. ↑ Johnson, Michele; Harrington, J.D. (17 April 2014). "NASA's Kepler Discovers First Earth-Size Planet In The 'Habitable Zone' of Another Star". NASA. Retrieved 17 April 2014. ↑ Johnson, Michele (20 December 2011). "NASA Discovers First Earth-size Planets Beyond Our Solar System". NASA. Retrieved 2011-12-20. ↑ Mallama, A.; Wang, D.; Howard, R.A. (2006). "Venus phase function and forward scattering from H2SO4". Icarus. 182 (1): 10–22. Bibcode:2006Icar..182...10M. doi:10.1016/j.icarus.2005.12.014. ↑ Mallama, A. (2007). "The magnitude and albedo of Mars". Icarus. 192 (2): 404–416. Bibcode:2007Icar..192..404M. doi:10.1016/j.icarus.2007.07.011. ↑ Clifford, S. M. and T. J. Parker, 2001: The Evolution of the Martian Hydrosphere: Implications for the Fate of a Primordial Ocean and the Current State of the Northern Plains, Icarus 154, 40–79. ↑ "Artist's Concept of Earth-Like Planets in the Future Universe". Retrieved 22 October 2015. ↑ Choi, Charles Q. (21 March 2011). "New Estimate for Alien Earths: 2 Billion in Our Galaxy Alone". Space.com. Retrieved 2011-04-24. ↑ Robert M. Zubrin (Pioneer Astronautics), Christopher P. McKay. NASA Ames Research Center (c. 1993). "Technological Requirements for Terraforming Mars". ↑ Mat Conway (2007-02-27). "Now We're There: Terraforming Mars". Aboutmyplanet.com. Retrieved 2011-08-20. ↑ Peter Ahrens. "The Terraformation of Worlds" (PDF). Nexial Quest. Retrieved 2007-10-18. ↑ Sagan, Carl (1961). "The Planet Venus". Science. 133 (3456): 849–58. Bibcode:1961Sci...133..849S. doi:10.1126/science.133.3456.849. PMID 17789744. ↑ Zubrin, Robert (1999). Entering Space: Creating a Spacefaring Civilization. ↑ Fogg, Martyn J. (1995). Terraforming: Engineering Planetary Environments. SAE International, Warrendale, PA. ISBN 1-56091-609-5. ↑ Birch, Paul (1991). "Terraforming Venus Quickly" (PDF). Journal of the British Interplanetary Society. ↑ Landis, Geoffrey A. (Feb 2–6, 2003). "Colonization of Venus". Conference on Human Space Exploration, Space Technology & Applications International Forum, Albuquerque NM.